Renamo claims that extra ballot papers were given to Frelimo members during municipal elections. Maputo — Maxixe (Mozambique), 10 Oct (AIM) - The Maxixe District Elections Commission (CDE) in the southern Mozambican province of Inhambane is worried at signs of a high level of abstention in this city in Wednesday's municipal elections. As in much of the country, there were long queues of voters when the Maxixe polling stations opened at 07.00. But a few hours later scarcely any voters at all were making their way to the stations. When AIM visited the polling stations in the early afternoon, it found them virtually deserted. For example, there were almost no voters to be found at around 14.00 in the seven polling stations in the 29 November Secondary School. 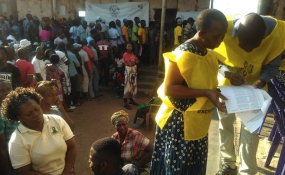 The polling station staff members (MMVs) said that all the signs were that the situation would remain unchanged until the end of voting at 18.00. The electoral law states that the polling stations close at 18.00 unless there are still voters in the queue, in which case they stay open until the last person has voted. But in Maxixe here are no queues. The chairperson of the CDE, Mateus Roberto, said the situation worried him. "Everything indicates that we will have high levels of abstention. The movement of voters does not correspond to the number of voters registered". Maxixe (which, although it is not the provincial capital, is the largest urban centre in Inhambane) registered 62,062 voters - and nowhere near that number bothered to go to the polling stations. Roberto said the high abstention was predictable right from the start of voting, since "in all the polling centres, stations one and two had a much higher attendance than the rest of the stations". In general, polling stations one and two are formed by potential voters who register in the first few days of the voter education campaign, and can thus be assumed to have a more positive outlook towards voting than those who register much later and form the other polling stations. Roberto added that, in the first hours of voting, most of the voters were relatively old, and in all the polling stations visited, there was not much sign of young, first time voters. "In future, we must reflect n what more we can do, in terms of voter education, to encourage young voters to cast their ballots", he concluded.